Make plans to visit Grouse Creek and stay at the Box C Guest Ranch. This two-bedroom ranch house can sleep up to six and has a spacious living room with connecting dining room and kitchen. There are two bathrooms, washer, dryer and a large screen TV. It is a perfect place to do some wildlife observing or you can just sit back on the front porch and be serenaded by the coyotes. Horse facilities are also available for those who want to bring your horses and explore the surrounding area. If you like camping but you would rather stay dry and sleep in a bed, then this is the place for you. This 2-room cabin has a sofa-sleeper, a futon bunk bed, a wood stove, and a table. 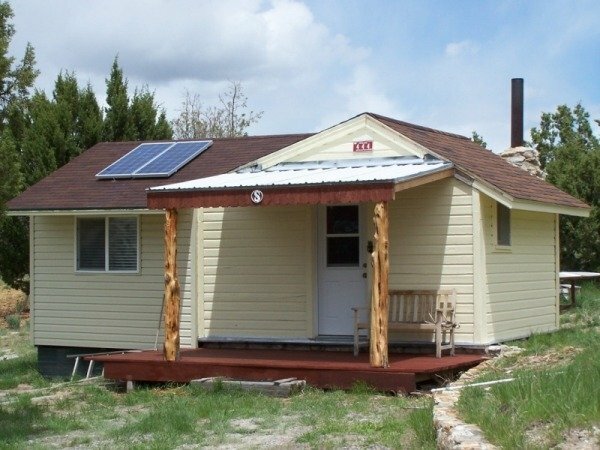 The house has solar and wind power for electricity and includes a microwave oven and a mini fridge. Come sit around a fire in the firepit and tell stories surrounded by quiet nights and stare at the stars above you. Perfect as a base camp for those who are hunting. The cabin has recently been remodeled and expanded to include a separate bedroom and a bathroom is currently being built. In the meantime, there is an outhouse on the property. The cabin now also includes a sheep camp that sleeps one to two people. In total, the property can sleep 6-8 people indoors, with room for many more in tents. The Loafin’ Shed is located next to the GC Gone Country store. Prices are $55.00 / night with one bed, $67.50 / night with one bed and the loft. Please call Joann at 435-747-7273 to make a reservation.